In her latest journal article, published in Land Use Policy, Sarah Mills of the Ford School elaborates on public attitudes pertaining to wind energy development projects before and after the completion of the project. In “Exploring landowners’ post-construction changes in perceptions of mind energy in Michigan,” Mills and her co-authors Douglas Bessette and Hannah Smith contest the typical understanding of homeowners' sentiment for wind turbine projects. Contravening to conventional wisdom, the reserach finds there are two separate trajectories of attitudes of landowners, determined by "their perception of the fairness of the wind siting planning process." Should the initial planning process prove “fair"—financial compensation, for instance—then the attitude of homeowners’ tend to be more positive in nature over time; conversely, “unfair” treatment during the planning phase fosters a negative attitude after the completion of the project. In identifying the relationship between homeowner attitudes and treatment during the planning phase of the project, Mills et al. believe that their findings will prove crucial for future wind energy projects in Michigan, as it suggests that wind developer actions and local government planning processes are very important to building community support for wind projects. 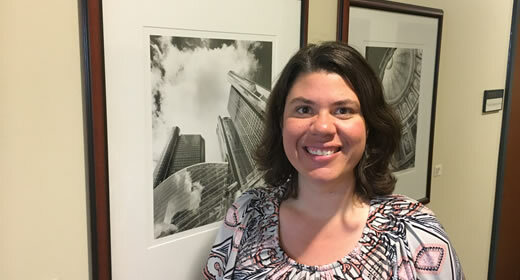 Sarah Mills is a Senior Project Manager at the Ford School's Center for Local, State, and Urban Policy (CLOSUP). She serves as project manager for the National Surveys on Energy and Environment (NSEE) and the Center's Energy and Environmental Policy Initiative.